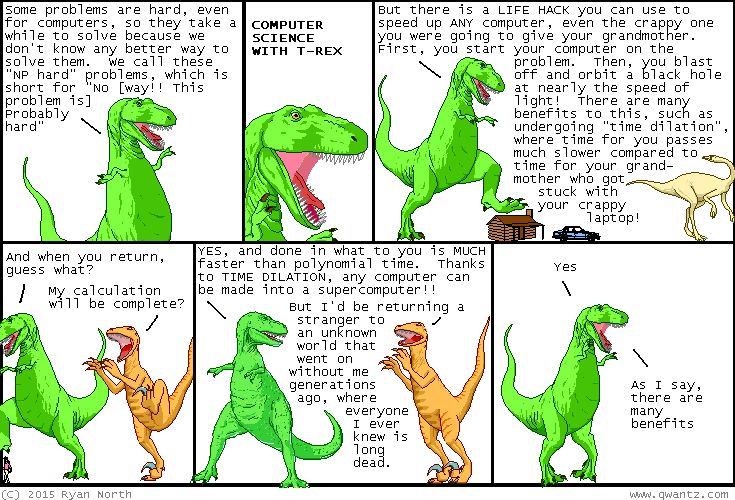 Dinosaur Comics - October 2nd, 2015 - awesome fun times! October 2nd, 2015: In conclusion, I hope we all learned a lot today about computers, and hit me up any time you have a computer problem because I stand ready to assist you. I thought I was the first one to come up with this idea, but it turns out there's papers about it! So not only is this comic TRULY HILARIOUS AS ALWAYS, it's also mega legit. One year ago today: later on, when this is published in book form: "oh no, you have overdosed on book"